We had a bunch of our friends and their kids over this weekend for a little get together. Zoe and our friend Zachary took a break from running around outside for a VERY short coloring rest. Just long enough to snap this picture! 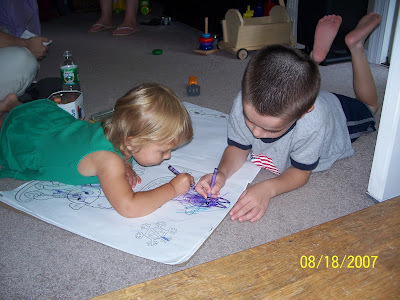 I just love how Zoe tried so hard to color just like Zachary. She even made sure to pick out the same color! And I was very impressed at how well he did with sharing his coloring space! Check out what everyone else shared over at Picture This!